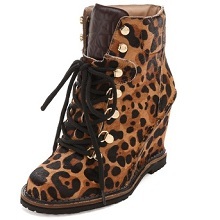 The hiking boot gets a chic, exotic update with these DVF booties, rendered in Leopard-print haircalf and finished with a wedge heel. Polished brass hardware glints from the lace-up closure, which threads through hooks along the logo-embossed leather tongue. Padded shaft and covered wedge heel. Lug sole.